That title is quite the mouthful! When we bounced around ingredients for this month's Royal Food Joust, we had no idea how difficult it would be to come up with our own entry. The trifecta of ingredients seemed to make sense at the time of discussion. No, because then most of the entries are going to be dessert. Yeah, that's right. Desserts aren't bad, but we need items that could go either way. What about an herb or a spice? Nah, we just had cilantro. And with coffee? OK, herb or spice to go with coffee? Let me think. Go with a common one. Sure. 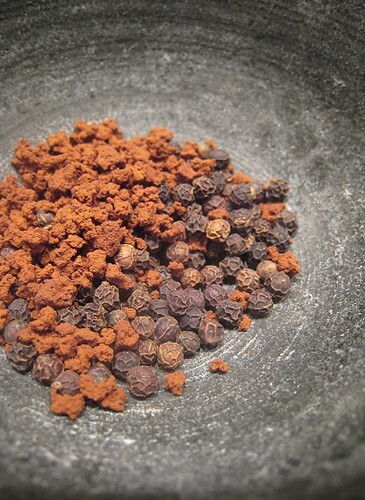 Everybody uses black pepper. Then something to sweeten everything up. Okay. It's a common enough ingredient. So we have it? Coffee, black peppercorn, honey. With all the sure-ing, it seems we've assured ourselves of no-entry this month. We swayed back and forth between sweet and savoury entries -- and still couldn't decide on anything even with just two days left. We changed our minds so many times this Joust -- that what we have is just what we have right now, just before the deadline. We originally thought of a dessert ravioli: we would fry up some coffee-flavored pasta with a honey-mascarpone filling and sprinkle some black pepper sugar on top. But, since we already did fried dough last time, we had to think of something else. We had no idea it was going to be this hard. Since we couldn't decide on sweet or savoury, we figured we'd do both -- and where and which meal do we usually have sweet and savoury on the plate? Basically, take your favorite pancake recipe and add 2 shots (2 ounces) of brewed espresso or strong coffee. Of all the elements, I was most fearful of this one. I mean, what if this "coffee-crusting" was a massive failure? But, bacon is such a strong flavor that it stands up well to anything, it seems! It could even have used more coffee. But, I'm getting ahead of myself. To start, I had to crush some black peppercorns and coffee granules. 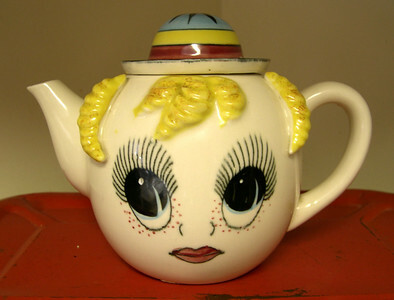 I used instant coffee just because it had big granules. I didn't need too fine a powder. I wanted a more chunky crust for the bacon. There. That's what I wanted. ... and fried them up! Just a note, we do like our bacon quite extra-crispy (especially Mama!). Also, I believe the coffee also added to bronzed color. 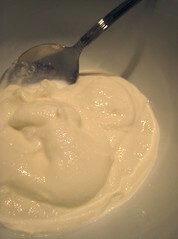 To smooth out the ricotta, I buzzed it a little in the food processor. Once I got the silky texture I was looking for, it was just a matter of adding the honey. I also sprinkled some black pepper there. It was just a matter of putting all the elements together. 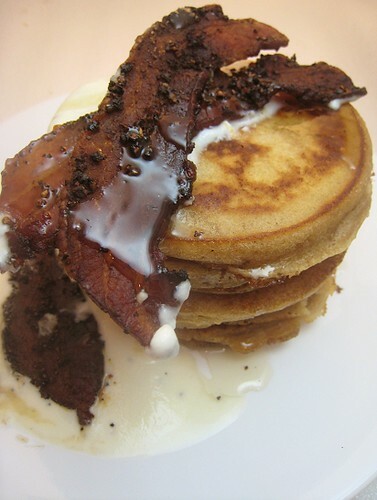 I stacked some pancakes, drenched it with honey ricotta sauce, and added some pieces of bacon. As a final touch, I drizzled honey all over the whole thing. Of course, no quantities are required. Want more pancakes? Make a lot more! Want more bacon? By golly, make a lot of bacon. More honey-ricotta? Use a big tub of ricotta! I cautioned against making the coffee the dominant flavour in the pancakes. 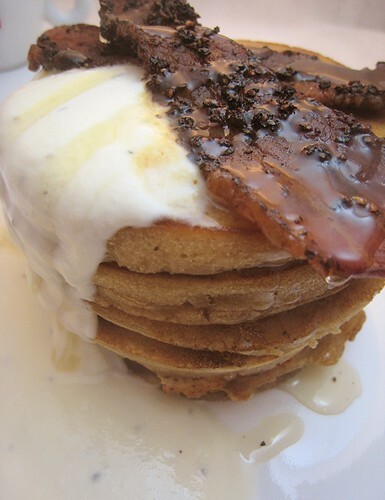 First, I was afraid that too much coffee would make the pancakes overly dark. Overly dark pancakes would not look good in pictures. Second, I wanted the pancakes to taste recognizably like pancakes, instead of some sort of round coffee-cake like thing. The coffee should be an accent flavour, not the primary flavour. After all, we will be having coffee to drink too. But TS defied me! After adding the first shot of espresso, she added yet another! I need not fear. I was very happy with how the pancakes turned out. They were light, fluffy, buttery -- pancakes, with the whisper of coffee. 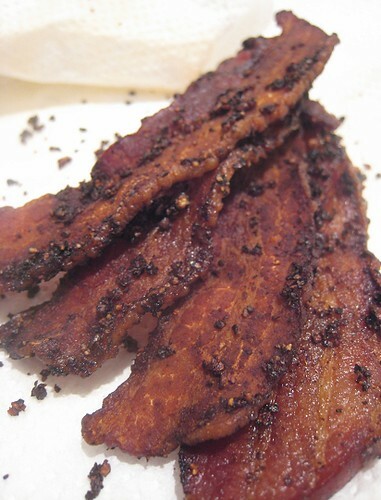 The coffee-crusted bacon? I don't really have that much to complain about bacon. Maybe it was on the dark side and could have used a little less colour. 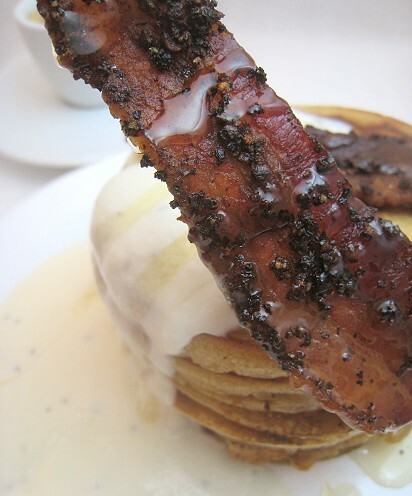 But of course, we already know the joys of black pepper bacon. The coffee added a touch of pleasant bitterness and even more of it could've been added to the crust. But the emergent star of this dish is the honey-ricotta. It's not everyday that bacon gets upstaged so this "sauce" is a real winner. 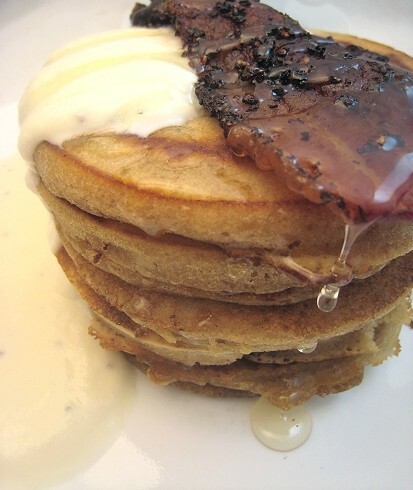 The honey-ricotta is the one element that brings all of the elements in this dish together, bridging the gap between the salty-smoky-peppery bacon and the coffee-sweet-buttery pancakes. It was smooth, silky, creamy -- really quite perfect. The only thing I'm missing are the sunny-side up eggs. I asked TS to make some for me but she refused. 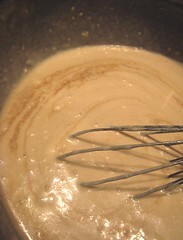 Take your favorite pancake recipe, any pancake recipe, and add a shot or two of brewed espresso. Cook pancakes as per usual. 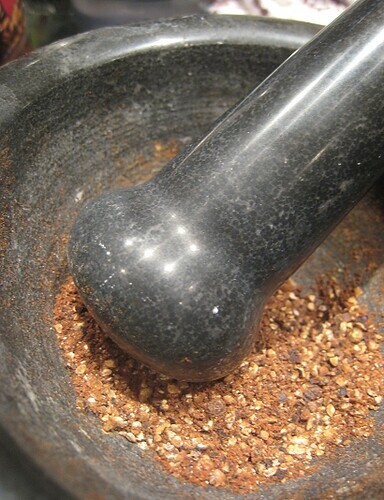 Crush peppercorns and coffee in a mortar and pestle or coffee grinder. Crush/grind to the level of coarseness/fineness desired. 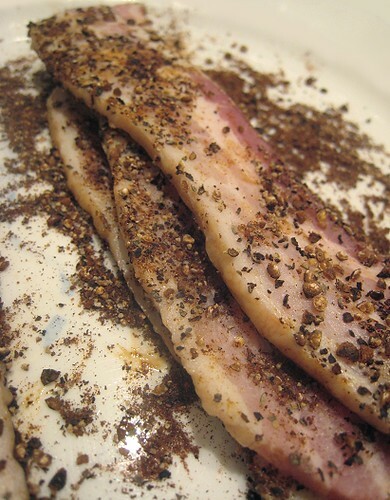 Coat bacon slices with the pepper-coffee mixture and fry to crisp up. 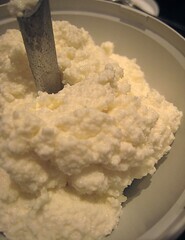 In a food processor, process desired amount of ricotta until smooth. Add black pepper and honey to taste. 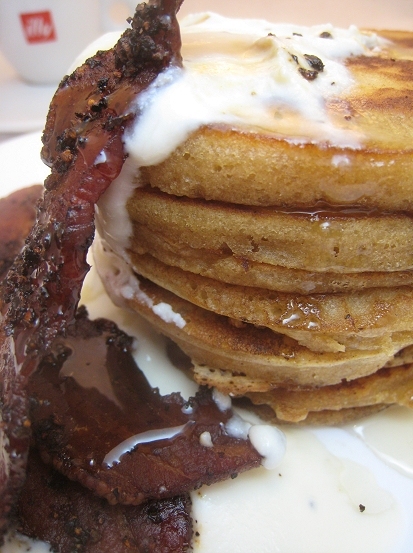 Serve coffee pancakes with honey-ricotta and bacon. 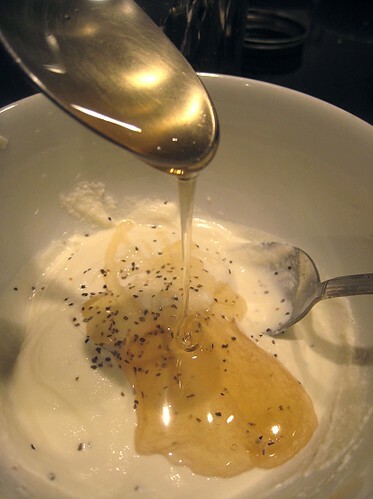 Drizzle the dish with more honey. Wow! That looks heavenly and an amazing breakfast to wake up to! This looks seriously delicious and with a breakfast like that under the belt, one could take on the world! Wow, that is a serious breakfast! My favorite are those thick slices of bacon. It all sounds wonderful. 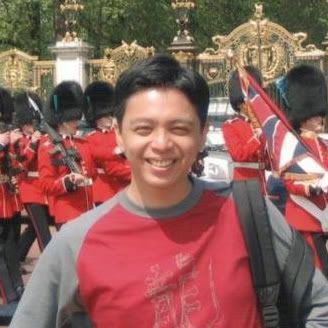 I didn't know you were part of the RFJ (well, I'm not, so it's not easy for me to tell, hehe)-- I am so impressed by the quality and feasibility of the creation you guys make from unusual combinations, I love it! Hold the sunny side eggs! I would enjoy this just as is, ricotta pancakes and anything and especially bacon with black pepper and coffee, Yes.........I want some this morning. Love this, want this, am drooling now....... Must go vote now! Every single componenet of this looks amazing! Actually, since I never like to wake up sooner than I have to, this will probably be a merienda (snack) item rather than breakfast. Hehe. Sounds like a good way to start the new year! I'm loving the photos! This is such a cool recipe, I'm definitely going to have to try it out ASAP. Come to think of it, this would make the perfect Christmas day breakfast!